An online observatory will webcast a free celestial marathon on Saturday (Oct. 20) to mark Astronomy Day, telling the story of our universe with the help of live shots from professional-quality telescopes. The online Slooh Space Camera will air 11 consecutive hours of free cosmic programming beginning at 3:30 p.m. EDT (1930 GMT). Viewers can watch live on their computers or iOS/Android mobile devices. The broadcast will take viewers on a tour of some of the universe's most spectacular sights, from dusty nebulas to supernova explosions that mark the death of huge, hot-burning stars to the planets and moons of our own solar system. In addition to Astronomy Day, the event coincides with the peak of the annual Orionid meteor shower, which will be at its best overnight on Saturday and Sunday (Oct. 20 and 21). 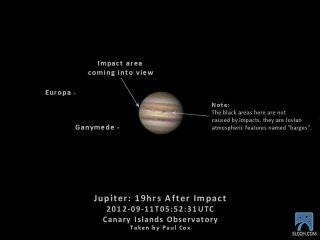 Live shots of such cosmic phenomena will be provided by an observatory in the Canary Islands, off the west coast of Africa, Slooh officials said. The webcast can be accessed at the Slooh Space Camera here: http://events.slooh.com/. Slooh outreach coordinator Paul Cox will host the broadcast. He'll be joined by several guests, including author and Astronomy magazine columnist Bob Berman. "Even with the use of Slooh's patented real-time imaging system, this is going to be incredibly challenging event — and several people have warned me against it," Cox said in a statement. "However, we're passionate about bringing live astronomy to a wider audience and making science more accessible. To paraphrase a famous speech, 'We choose to do these things, not because they are easy, but because they are hard!'" Slooh is putting the broadcast together to mark Astronomy Day, a twice-yearly celebration that aims to share the joys of astronomy with the general population. To see if there's an event occuring near you on Saturday, check out the Astronomy Day website. "I am proud to be part of this marathon-of-the-universe," Berman said. "It’s the first time in history that people everywhere can observe dozens of full-color celestial splendors in real time, free on Slooh’s homepage, as tracked by major telescopes and displayed on their home monitor or portable device. This may mark a new era in the appreciation of our cosmos."